Welcome to day 4 of release week at SugarPea Designs! We’ll be showcasing new products every day this week! The new products will be available tomorrow at 6 p.m. Eastern time! 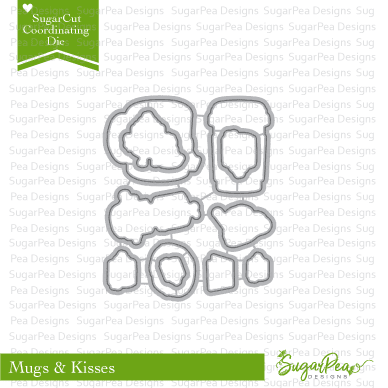 Today we’re highlighting the Mugs & Kisses set (along with the matching SugarCut set). Is it ok if all the sets this week are my favorite?!? Just look at the darling images in this set! This will be another “go to” set for sure! See you tomorrow with more the final day of sneak peeks, then at 6 p.m. the links will go live and you can shop ’til your heart’s content!! I love the background–it looks just like my countertop when the grands gather here for hot cocoa!! Thanks. Awesome card. Yes it’s okay that each set is your favorite. This a great release and I can see why each one is your favorite. It’s fine to love everything in this release. Lovely card you created. I love your card and this new set is awesome. Love that yummy background. Perfect with the coffee and donut. What a great card! I can smell the coffee already. cool bg for these cute stamps! Wonderful card! I love the background. Amazing card ! And the perfect background for this stamp set ! Thanks so much for sharing and for inspiring ! Gorgeous BG to compliment these sweet treats! Love your card. This is such a fun set. Your card is just lovely and the background stunning ! What a fun background for these cute stamps. Terrific mugs & kisses card with an almost lickable background! So bright and cheerful. Love the colors. Oops. Did not mean to leave two comments but could not figure out how to delete one. Sorry. This is gorgeous. Love that image. Oh so cute, lovely background, this stamp set is so cute!